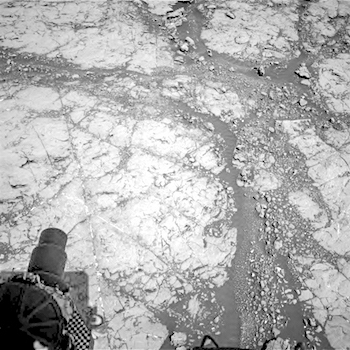 Sols 1861-61, October 30, 2017, update by MSL scientist Ryan Anderson: We are starting to suspect that Vera Rubin Ridge might be cursed. After the challenges we faced last week, we were hoping for a successful weekend plan but alas, it was not to be. Over the weekend Curiosity’s arm didn’t heat up as much as it was supposed to, so the arm activity failed and most of the weekend plan was lost. So today the name of the game is to try again! This entry was posted in Reports and tagged Aeolis Mons, Curiosity, Estecourt, Gale Crater, Lisbon, Mars Science Laboratory, Mount Sharp, MSL, Murray Formation, NASA, Ogunquit Beach, Region 7, Schmidtsdrif, Vera Rubin Ridge. Bookmark the permalink.